Small trees have many advantages including: 1) being healthier and producing more fruit, 2) being more manageable in that no ladder is needed, 3) allowing for more than one tree in your backyard because a small tree takes up less space and 4) enabling the gardener to more easily manage the quantity and size of fruit produced by thinning. Deciduous fruit trees (and other shrubs and trees that drop their leaves in winter) store up energy in winter and grow in summer. Winter pruning allows for shaping, but it does not control growth. The best time to control growth is summer. The best time to plant and shape is winter. When planting a young, naked, bare root fruit tree in winter, cut it down to a short stick around 24 to 30 inches tall. This instantly creates a low branching structure that will ultimately keep the canopy within reach of the gardener. 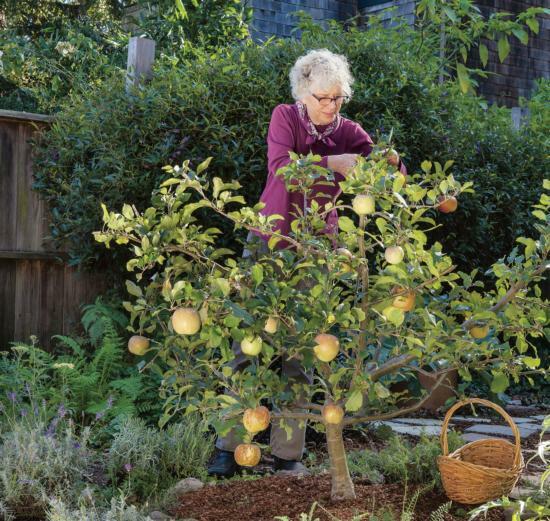 You can also opt for dwarf fruit trees, which often stay around 10 feet tall and wide. But you still need to prune for shape, and your choice of fruit varieties will be significantly limited. Semi-dwarfs still get big – up to 20 feet tall - which makes harvesting challenging. The good news is you can keep full size fruit trees smaller by pruning in summer. There are only two kinds of pruning cuts to know about: heading and thinning. Thinning is when you cut a branch out entirely to let in light. Heading shortens branches to create bushy growth from the buds that remain. The tree will respond immediately to the cut by sending out new growth. To avoid unsightly stubs, make clean cuts that are close to buds. If you’re pruning an old tree, start by removing any diseased or damaged limbs. Understand how fruit grows on your tree. For instance, peaches and nectarines grow quickly yet only bear fruit on last year’s growth, so remove at least half of year’s growth. Figs only fruit on new growth, so older wood only adds to new height and width – not new figs. Plan on removing about 20% of last year’s growth on most other fruit trees. You can learn more about specific trees and their pruning needs at http://homeorchard.ucanr.edu/. Learn more by reading the UC Agriculture and Natural Resource publication, Home Orchard: Growing Your Own Deciduous Fruit and Nut Trees.